Higher throughput, increased flexibility, less manual handling, reduced dependence on forklifts.. these are among the benefits that Cooper B-Line Inc. has realized from a new conveyor system installed at its Reno manufacturing facility. Cooper B-Line Inc. is an Illinois-based manufacturer of electrical, mechanical and telecommunication supports. Its Reno manufacturing facility specializes in the racks, runway and related component kits used in the telecommunications industry. Until the new system was installed just over a year ago, the Reno facility had no conveyor materials handling equipment in place. "Basically, we were building loads on the floor and moving everything around by forklift truck," recalls Matt Emerson, Cooper B-Line's facilities engineer. "After we built a pallet load, we would have to wait around for a forklift and driver to move it before we could start working on the next order." The new conveyor system has resulted in an operation that is not only more productive, but also more ergonomic. It incorporates both standard conveyor equipment from Hytrol and a unit specially customized for the Reno facility by FloStor. Material flow at the Reno manufacturing center is now streamlined and efficient -- and manual handling is kept to a minimum. 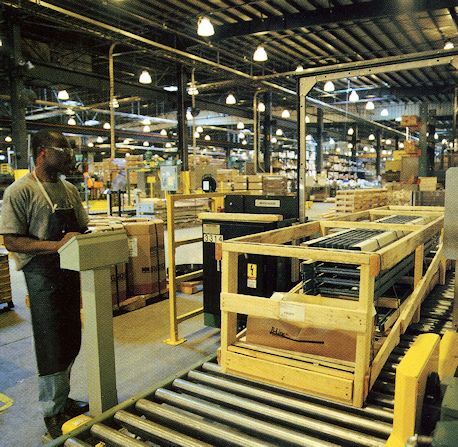 Forklifts and transfer carts bring the telecom racks and runway to the packing stations, which are located adjacent to the two main conveyor lines. The assemblies are stacked onto pallets resting on drag chain conveyors at the packing stations. A typical load would be stacked four feet high and weigh in excess of 1,000 pounds. After the pallet is built, chain transfers move the load onto the main takeaway conveyor line. There's no more waiting for the forklift to arrive. That takeaway line is a chain-driven live roller from Hytrol (Model 25-CRR) designed for handling loaded pallets. On the line that handles most of the standard high volume orders, the pallet loads can take one of two routings. Regular orders that do not require crating or additional protection pass through a banding machine and then are transferred to an order-accumulating conveyor. This is a drag chain unit with an accumulation module to keep the pallet loads from contacting one another. 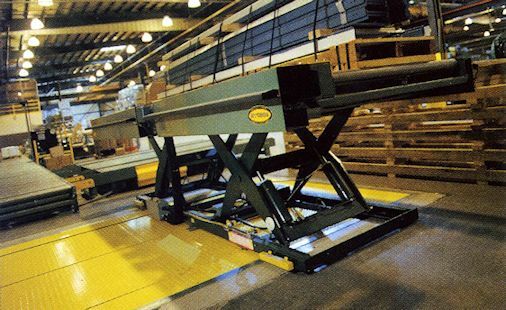 Loads that require crating pass through the banding station and then move down to the end of the chain-driven line onto a specialized crating station. Designed for Cooper B-Line Inc. by FloStor, this unit is actually a combination of transfer cart, lift table, and conveyor. The crating station moves the pallet load away from the main line and elevates it, allowing workers to crate and secure the load safely and efficiently without bending and handling. 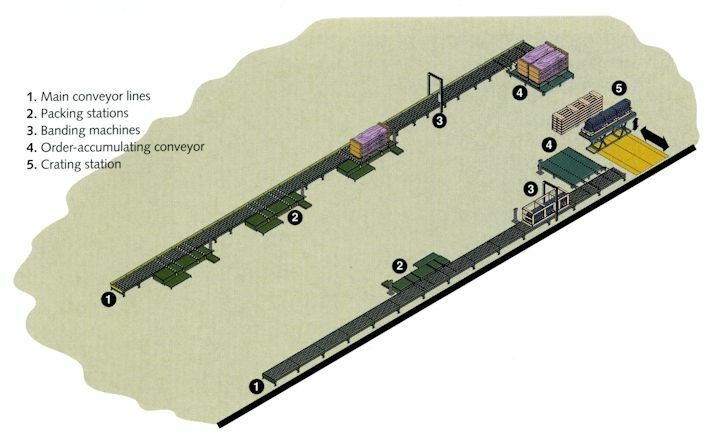 Once the crating is finished, the load is transferred back onto the main takeaway line and moved either to the order- accumulation station or to the banding station if additional straping is required. The installation at Reno is a good example of how standard conveyors can be effectively integrated with customized units to deliver multiple benefits. "We're now seeing throughput levels that are 30 to 35 percent greater than what we had before the system was installed," says Facilities Engineer Emerson. He adds that the Reno facility now averages about 150 racks per line in an eight-hour shift. The new conveyor system also has enabled Cooper B-Line Inc. to more effectively secure the pallet loads. Operators can control the positioning of the pallets as they move through the banding machines. This results in more precise banding and enhanced load security. Finally, workers can do their jobs more efficiently and with a lot less strain. The heavy-duty chain transfers move the loads effortlessly onto the takeaway lines. And the adjustable crating stations allow workers to crate and secure orders with minimum bending and maximum access to the load. In short, the new conveyor system can be considered a win/win/win for Cooper B-Line Inc., its workers, and its customers.